Believing that much of the popular management writings are sensationalistic and shallow and that the academic writings have substance but little practicality, Nelson bridges the gap and translates academic thinking into clearly articulated, useful methods to identify problems in organizations and seek workable solutions. 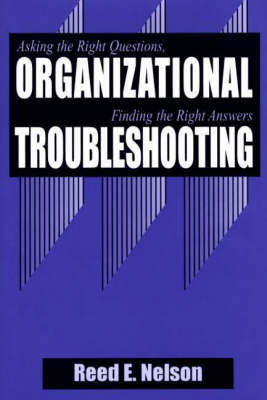 His book explores organizational dysfunctions and pathologies neglected by both scholars and the popular business press, and proves that with the timely use of diagnostic techniques and the application of simple theories, risks and opportunities-that might lurk unseen in an organization-can be uncovered and capitalized upon. Readable, well documented, with step-by-step instructions for all of the quantitative techniques he presents, Dr. Nelson's book will be an important addition to the practical literature on management and will give academics new ways to train students of management in the day-to-day methods of running a business. Nelson targets his book at managers and consultants who must diagnose organizational problems, but who lack the time and resources to assimilate and apply the large and increasingly esoteric literature on the subject. Recent diagnostic advances and how they can be applied in concrete situations are explained in detail. Analysis of organizational cultures, social network analysis, and cause mapping are three specific techniques explained and demonstrated. The casues and types of organizational dysfunctions-common but infrequently discussed maladies that afflict most organizations-are also discussed in depth. Several methods of detecting dysfunctions before they spiral out of control are suggested and demonstrated using actual cases. Simple and cost effective techniques which yield useful information and insights are emphasized. Special emphasis is given to the needs of smaller organizations to whom many traditional approaches to organizational diagnosis do not apply.